Front-drive and long handle arms enable sustain, smooth and engaging exercise, regardless your fitness level. Pedals Self balancing, close spacing, enlarge, impact-absorbing, fit to any size user and provides gentle movements to reduce lower body stress. Cardio Monitor In-built metallic pulse sensor provided with U bar style and upper handle grips enables to the cardio monitoring on board. Display Feedback Multi feedback read out instantly displays time, distance, RPM, calories, heart rate, speed, work (Resistance) levels, watts and mets. Strides Wheel Dual wheel track, fiber glass reinforced nylon wheel with high quality bearing. Centre of Gravity Low COG combined with a balanced frame which prevents rocking. Step-up Height 08 Inches easy step-up height. 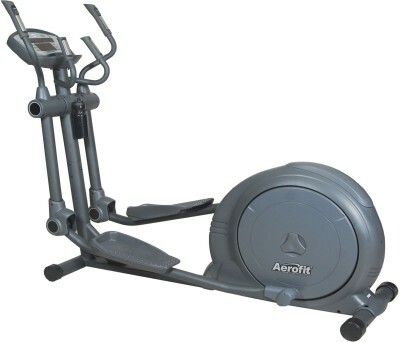 To Recieve updates and possible rewards for Aerofit AF 80E please sign in. To Recieve updates and possible rewards for Cross Trainer/Elliptical please sign in.